Although in Western countries technology is accessible to a great demographic mass, females handling technology is still perceived as deviant and women’s hacker clubs remain on the fringes. 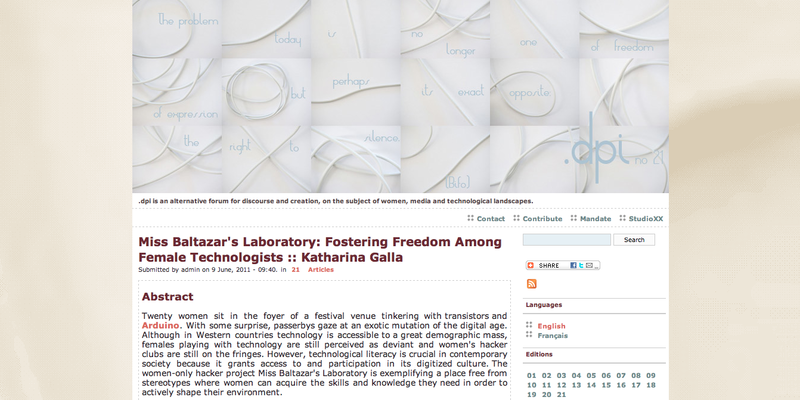 This article introduces and discusses artist and teacher Stefanie Wuschitz of Austria and her women-only hacker project Miss Baltazar ‘ s Laboratory , exemplifying the cyberfeministic trend of current media culture. The term cyberfeminism dates back to a group of women who became active in Internet-based art and activism in the 1990s. There is no one definition describing the practice of cyberfeminists, rather the term emerged when it became clear that the Internet was not going to be a neutral space, but that questions about gender continue persist. Whereas it is sometimes used to describe the sum of feminisms expressed throughout the Internet, it can also mean an emphasis on female practice with digital technology. This more broad conception is used here in the practice of Miss Baltazar’s Laboratory promoting the use of technology among girls and women. Wearable Tech Workshop at the Electric Tech Carnival 2009 – The hour of birth of Miss Baltazar’s Laboratory. In relation to men, the number of women using technology for the production of creative and cultural content, its altering and re-use, the changing of the modes of production and the digital infrastructure all together, is marginal, albeit growing. In Austria, only 10% of the workforce in IT are women; girls in hacker spaces worldwide amount to merely 2% 2. How can this be, despite the acclaimed free access in the Open Source and DIY movements of the Internet? “Sometimes the social barriers are still very high,” says Stefanie Wuschitz. She recalls that she was not allowed to play with a compass in her childhood. Wuschitz speaks of an invisible censorship, which can be traced back to the way women are socialized in Austria, but also in many other countries in the world. Girls are supposed to be different than boys, have different interests. Playing with technology in young age today is comparable to climbing on trees and handcrafting with wood in the past: typical boys’ play. And frowned upon, if girls simulated their games. The kind of web-based technology being discussed herein holds strong male connotation, on the one hand, due to its socio-historical embeddedness in typical male professions, on the other hand, due to its surrounding discourse. This is highlighted by most of the terminology used in the field, such as micro-controller, sensor, Arduino etc. The latter is thus often re-named Arduin-a in female only groups applying Latin grammar laws to turn a masculine into a female word 3. Generally, hacker space models embody the currents of our society, offering a face-to-face peer-to-peer learning environment, but also through an online connectivity. Moreover, the groups pop up spontaneously, they have a flexible democratic structure rooted in the DIY, free culture and Open Source paradigm and are open to all. Yet, Wuschitz recalls, she felt as if “in another country” when she entered a hacker space in her home city Vienna, because it’s a homogenous group of male members, which shaped its internal culture. That is, its language, habits, food, friendships, and most importantly, the way knowledge is transmitted. Together with her friends Carl-Erik (Calle) Engqvist, Karin Jangert, sisters Elmira and Ramona Zadissa and Jennifer Sarich-Harvey, Wuschitz founded an NGO in Sweden in 2008, that is now based in Vienna and runs supported by the Austrian government. Miss Baltzar’s Laboratory 4 presents an infrastructure only for women interested in technology. There, they can be among their kindred, break with the androcentric worldview and demystify the concept of technology. They aim to facilitate access to Open Source Software, hardware and technological production by offering free workshops, lectures, debates, exhibitions and public interventions. They emphasize fostering the creative potential in every participant to become producers of culture by use of technology. Some courses are based on the use of social media, blogging and programming, while others are craft-oriented dealing with recycled clothes turned into e-textiles, using LilyPad 5. Moreover, they strengthen the confidence of female technologists as role models and teachers by encouraging tinkerers who produce in solitude to share their work as invited guest teachers. Thus, they bring together women from different backgrounds and cultures to exchange their knowledge, yielding interesting collaborative outcomes. For instance, Stefanie recalls, that the project outcomes of the artists she worked with in Damaskus were quite similar to the ones of a group of professors from Manhattan, who had a completely different social background. With its base in Vienna, the network of Miss Baltazar’s Laboratory is gradually solidifying. It is connected to groups in New York, Sweden, Damaskus, soon in Hannover and many more as Wuschitz spreads the word regarding her cyberfeminist activities. Important connections are made amongst female tinkerers throughout the world, therefore they demand and occupy a share of the field. 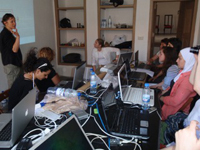 Interactive Storytelling Workshop with Stefanie Wuschitz and Kyrah Kosina in Damaskus, Syria, June 2010. © Courtesy of Stefanie Wuschitz. Installation from the Interactive Storytelling Workshop in Damaskus, Syria, June 2010. © Courtesy of Stefanie Wuschitz. Arduino Kick Off at the Interactive Storytelling Workshop in Damaskus, Syria, June 2010. © Courtesy of Stefanie Wuschitz. This has happened in the LilyPad community. The co-developers of LilyPad, Leah Buechley and Benjamin Mako Hill, recently conducted research on engineering and design communities that are using Arduino and LilyPad. They found out that “women are a significant percentage of the people who purchase LilyPad kits, and seem to make up a majority of the people who construct and document LilyPad projects” 6. The LilyPad community has the potential to grow into a female dominated computing community, if women will collectively overcome what is known as stereotype threat. This concept adheres to what has been explained above, namely the undervaluation of the potential performance of minorities. In women-only communities this stigma disappears; they find the freedom to experiment with new tools. There are new tools and networks emerging that define today’s culture and which must be learned by everybody who wants to participate in its production actively, rather then being a passive consumer. It is not how to use a gadget, but to dismantle, to rebuild and make it work again, or build an entirely new device that is empowering. To fulfill what they see is their duty to help other women become active participants in contemporary media culture, Miss Baltazar ‘ s Laboratory is essentially built with and on technology. In that, looms the political relevance of Miss Baltazar’s Laboratory , based on two levels female liberation. First, the personal liberation of societal ties where women to stay away from messy tinkering and complex computing; the Laboratory opposes this. Second, the Laboratory reaches out and collaborates with female groups and the rest of the hacker community, mimicking Open Source culture which was founded on an a-hierarchical and a-sexual grounds, and virtually lives from sharing. Ultimately, breaking, soldering and programming can yield understanding, practical skills and critical thinking on a universal topic: the ubiquity of technology. The fundamentals of our social structure are built with and dependent on technology, embracing all aspects of life from basic communication to work. Information, ideas, knowledge, languages, communication, images and codes are products of symbolic and analytical tasks at the higher level of economy, including IT and finance, as much as in a large part of tourism and gastronomy at the lower end 7. Even grand industrial production companies have to produce immaterial by-products in the form of corporate design. In the context of immaterial production, the economic takes on the qualities of the political 8. Author Michael Hardt compares the economic to the political act, pointing out that this endeavor brings along certain skills that are needed for political action, namely skills applied in aesthetic production. Once we grasp the ubiquity of technology, we must acknowledge the importance of technological literacy. To be versed in technology means to be able to participate in the production of economic, political and aesthetic structures and products at the same time. It further means an enhancement of freedom of movement in virtual and physical space, in communication networks and the labor market. As media culture bears new channels for speech and action – the latter being Arendt ‘ s vocal constituents of political behavior, it becomes obvious that the practice of Miss Baltazar’s Laboratory is not exclusive as traditional notions of feminism recall. On the contrary, what is named cyberfeminism is essentially the practice of democracy. Women learn how to use new channels of learning utilizing the language technology speaks. Technological literacy does not only refer to code language, but embraces the whole DIY paradigm, namely whatever an individual can teach him/herself to create with a device. At Miss Baltazar’s Laboratory , women learn new ways to express themselves and new content to speak about and share. At the same time, this new knowledge is highly valuable for creative, economic and political actions. Ultimately, as it is with all knowledge, it enhances freedom to speak, move and live altogether. Elke Schick is giving a workshop on Social Media Tools, May 2011. To accept the interdependencies between our lives and technology, a critical view on the production side of technology must be taken, which is also a concern of Miss Baltazar’s Laboratory . The circumstances under which the components for the production of technological devices and gadgets are born in Congo are inhuman. Same counts for all the women mounting computers and gadgets in Malaysia, Mexico, China and elsewhere. Miss Baltazar’s Laoratory thus aims at raising a concise and critical awareness of the role of technology in a global society. To put it differently, the identification as a minority and tinkering behind closed doors is not the end-goal, rather a point of departure, a way of gaining momentum as a community of cognoscenti that shows solidarity to other groups of women and people who are seeking to find a place within changing social, economic and political structures. Miss Baltazar is thus reaching out to a diverse female public to create a hub where knowledge exchange yields collective actions. Considering that all classes are for FREE and these girls are very active networkers, the community will potentially expand into a global Laboratory. Everyone interested in similar actions, please feel free to get connected and become part of a growing community. 3 In the English language, grammatical gender distinctions between female and male do not exist that could point to the actual gender of an artist, journalist, etc. In most of the other European languages, this distinction is linguistically determined, which evokes instinctive association of nouns with gender. Therefore, it is well possible, that, for instance, the Austrian community is more sensitive to the use of certain terms than Anglophone communities, as most of them are translate into masculine nouns. 5 LilyPad is a wearable e-textile technology developed by Leah Buechley and SparkFun Electronics, a popular online electronics retailer. The LilyPad has large connecting pads to allow them to be sewn into clothing, therefore, it is predominantly used to design e-textiles. It runs with the same software than Arduino and is washable. 7 Hardt, Michael. “Production and Distribution of the Common. A Few Questions for the Artist.” Open Magazine , Issue 16, October 2008. 8 Hardt, Michael. “Production and Distribution of the Common. A Few Questions for the Artist.” “Production and Distribution of the Common. A Few Questions for the Artist.” Open Magazine , Issue 16, October 2008.